Editor's Note: Diana S. ('17) looked into the difference between periodic and nonperiodic patterns. The first pattern that I decided to color in was under the section Non-Periodic Tiling. The book’s definition is: “a tiling is non-periodic if you cannot shift the pattern to another position that fits perfectly over the original position”. When I read this I still didn’t completely understand the concept because it was hard for me to visualize what they were talking about with the shifting. When I looked it up online and I still wasn’t able to understand it. I was only able to understand it once I saw the visual representation. I feel as though even the websites were having trouble explaining this topic. I found one website which had two good examples of nonperiodic vs periodic that I put below. 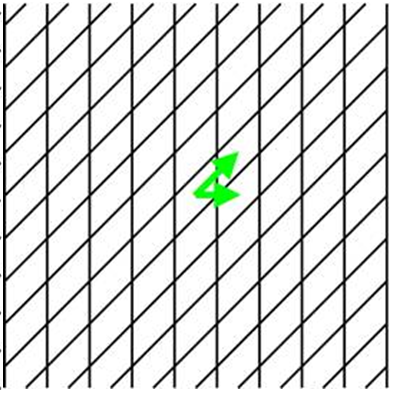 I think that these two photos (especially with the arrows) show how for the periodic, in both ways that you could shift over the shape and it would keep repeating itself. 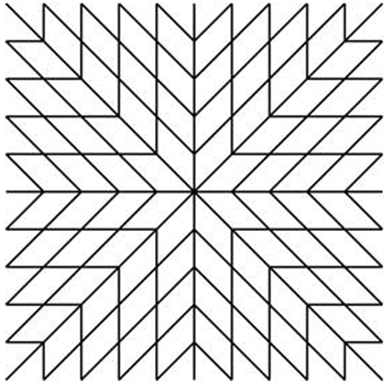 The specific nonperiodic tiling page that I chose was called Penrose Kite and Dart. The book talks about how in the early 1970s Roger Penrose discovered that two sets of shapes could only be tiled nonperiodically, or aperiodically. This tiling is interesting because the only way for the elaborate pattern to work is for the circular lines have to fit with each other, but the dart and the kite never fit together to form a rhombus. The second pattern that I colored in was under the Transformations section and it was called Twirl the World. I think that the title for this section is interesting and relevant to what we have been learning recently. The book’s definition for transformations is: “one pattern morphs into another”. This definition is newer to me because I usually think of transformations as stretching, shrinking, or moving a graph. Technically, the same thing is happening with these patterns, but because it is a pattern instead of a graph the changes are more significant or look more significant. ​This specific transformation was very intriguing to me because when I looked at the spirals, I mostly got drawn in by the optical illusion of how the spirals are curving and overlapping. When I read the description I found out this pattern is actually a map of the earth that has been transformed into a two dimensional image. The center point of all the spirals would be the north and south poles. And the 20 lines would be paths in different directions to get towards the other pole. To color this pattern in I used different colors to color in three spirals that did not over lap with each other. After doing this, I realized that in the center of the page, between the dots, there was a line of tiles that were almost straight and connecting the poles. After that I saw that at the center of that line and of the center of the page there seemed to be four squares of the same size. I then colored the two that were not colored and continued following that line. I found it really interesting that by experimenting with coloring in the pattern I was able to find another spiral that I never would have been able to see if I did not color it in.